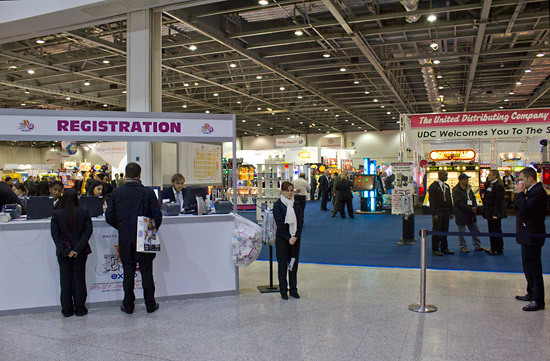 Location: ExCel London Exhibition Centre, Western Gateway, Royal Victoria Dock, London, E16 1XL, UK. It's a wet Wednesday in January and we're in London's Docklands for the 2nd EAG-Expo amusement trade show. The ExCel Exhibition Centre next to the Custom House DLR station is our destination. Pausing only briefly for a coffee from the Costa franchise in the foyer, we're into the main hall which is filled with familiar names from the amusement and coin-op business. 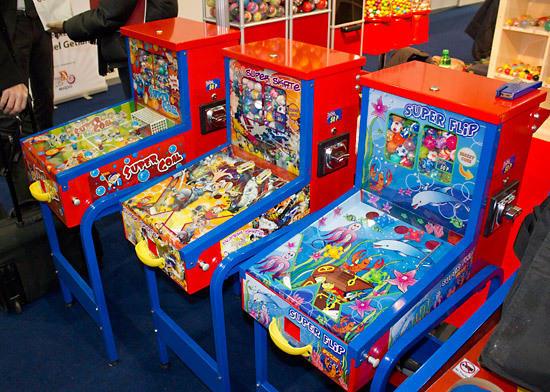 It was immediately apparent how the number of visitors for this year's show was down on last year's, although this is not surprising given the state of the coin-op business globally. There were a few empty spaces amongst the exhibitors, but the hall space was otherwise well utilised and those who made the trip seemed happy with the results. 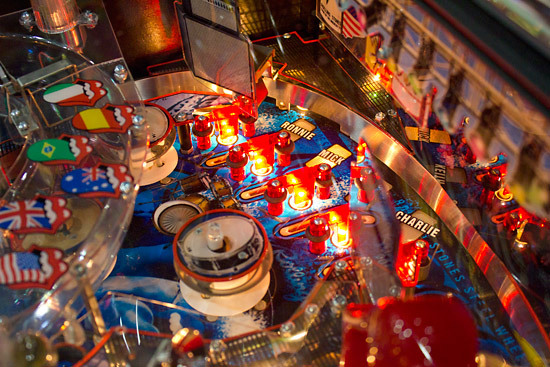 For the pinball fan, amusement trade shows have not thrown up too many shocks in recent years. 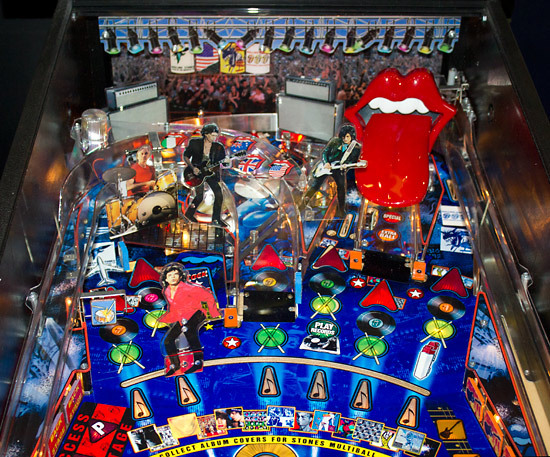 The latest Stern model is usually on display and this year was no different with Stern Pinball distributor Electrocoin showing three pinballs on their stand - two The Rolling Stones machines and an Avatar (regular edition). This was the second outing for The Rolling Stones, following its premiere at the German IMA show the week before and we covered the game quite extensively there, so we took this opportunity to play the game rather than take too many pictures. Don't worry though, the in-depth review will be coming before too long, and in the meantime here are a few more shots of the game. The software for The Rolling Stones was far from complete but the music sounded good and most of the rules were sketched out, even if several of the modes had no name (they were just called Mode 1, Mode 5, etc). The moving Mick target worked a little differently to the buck in Big Buck Hunter Pro. Rather than lighting the appropriate arrow insert when you hit the target at a particular point, it flashes the arrow and you then have to hit Mick at the same place on the playfield to light it solidly. Collecting all six arrows starts a multiball. Shooting the ramps adds a letter to spell out 'The Rolling Stones' but fortunately most of the letters are already filled in at the start of the game so it's not the bore-fest Indiana Jones rapidly becomes when trying to spell 'Raiders of the Lost Ark'. The outlane adjusters only have two positions, and with the outlanes at their maximum width, ball times were generally pretty short. There was a blanked-off mounting hole just above the inlane/outlane diverter on both sides where an extra post could be added to reduce the outlane width, but this was not implemented in these prototype games. 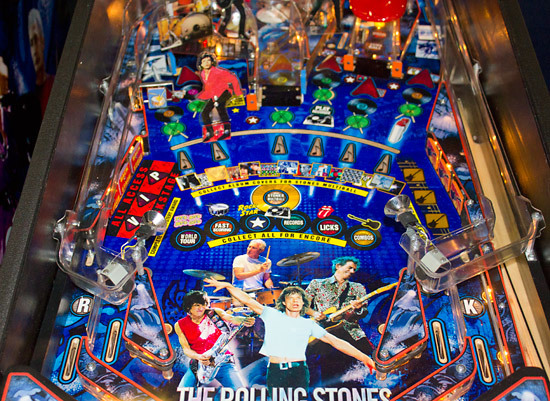 To find out a little more about the short ball times on The Rolling Stones and the design ethos behind their recent titles, Jonathan Joosten got Stern Pinball's head, Gary Stern to take some time out from the show and talk to Pinball News. You can hear Jonathan's interview with Gary right here. 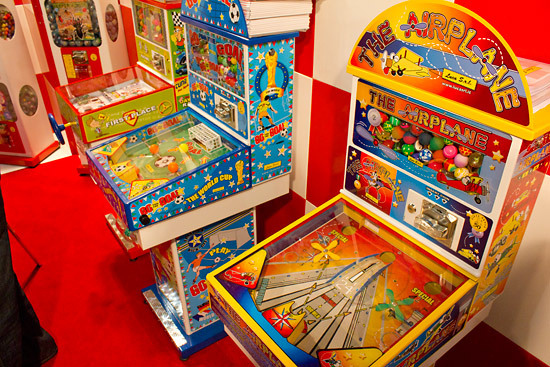 The EAG-Expo show usually has a couple of items of interest to pinball fans and this year we were able to bring you several. First stop was the Bifuca Recreativos stand where they were showing their new Pinball Tronic video pinball. The game comes in two cabinet sizes, one featuring a 32" screen and costing €2850 + tax and the other with a 42" screen for €3250. 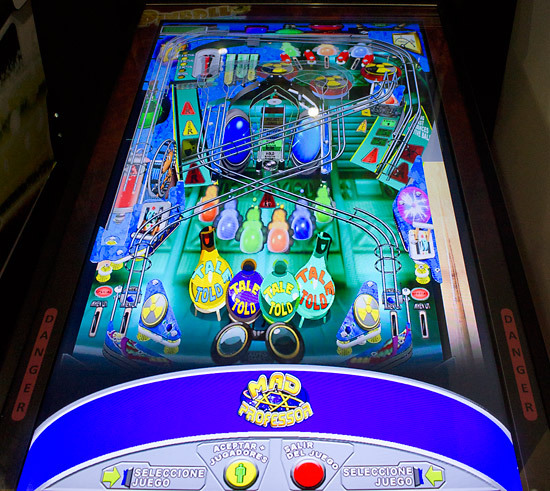 The game play was rather poor and the table very flat-looking, with the software seemingly programmed by someone unfamiliar with the pinball basics, but perhaps more interesting were the table designs. 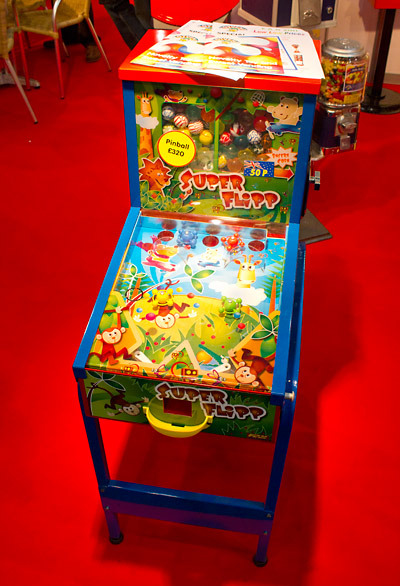 Here's their Super Hero playfield. Notice anything familiar? A coincidence maybe. Or maybe not. Here's another of their game designs - Mad Professor. Apparently the Spider-Man playfield design hasn't been licensed but there have been a few minor changes such as the left ramp dropping the ball into the left orbit instead of onto the left ramp return. Although the ball physics were a long way from realistic, they did manage to accurately emulate a ball jam in the shooter lane and nicely recreated what happens when the game loses track of how many balls are in play. 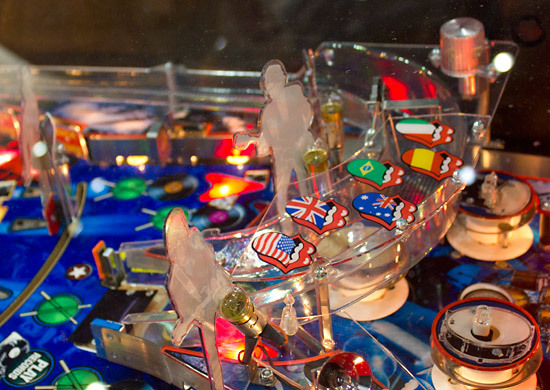 We've featured kids pinball games in various forms before, but this year there were several different models on display. These miniature pinballs from Italian company Luca S.r.l. awarded a bouncy ball to whoever made the winning shot. Meanwhile these machines from Fiam Automazione also awarded bouncy balls as prizes. 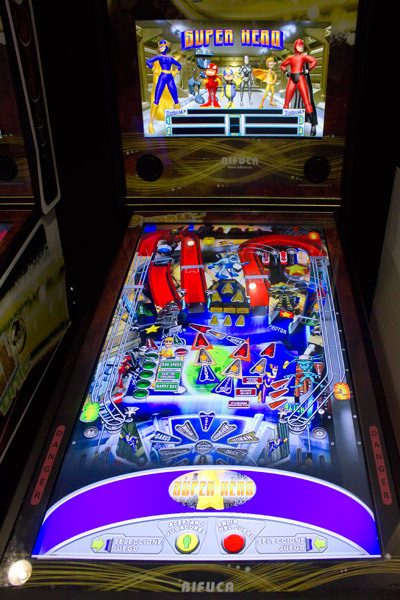 A third pinball-based bouncy-ball vending game was available from Toyvend for £320 ($510). 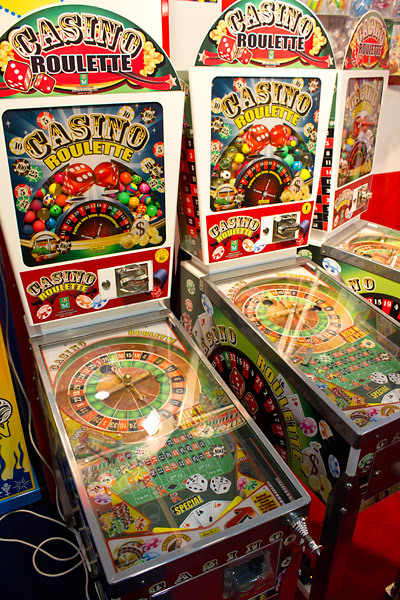 Apart from their more regular pinball games, Luca also had a combined pinball and roulette style dispensing game. Despite the name there was no gambling involved and the wheel was merely there to disrupt the ball's movement. Another product with a pinball element aimed at kids was the IX Simulator from Jolly Roger Amusement Rides. 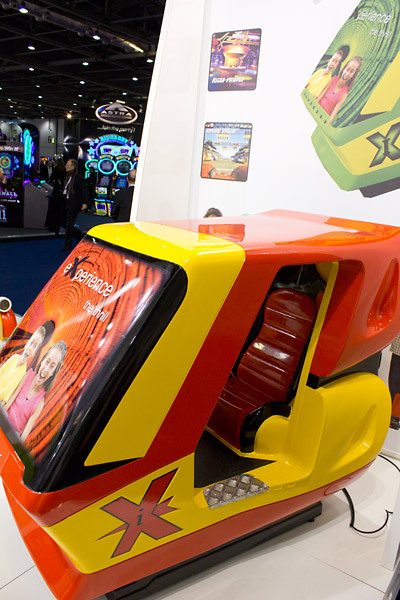 The 2-seater simulator features various types of rides, one of which takes the form of a pinball careering around a playfield. 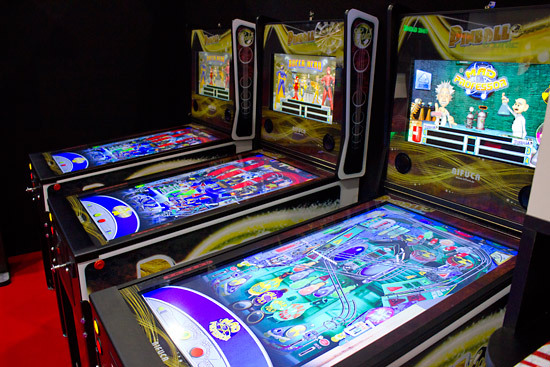 Our final exhibitor isn't directly related to pinball, at least not yet. 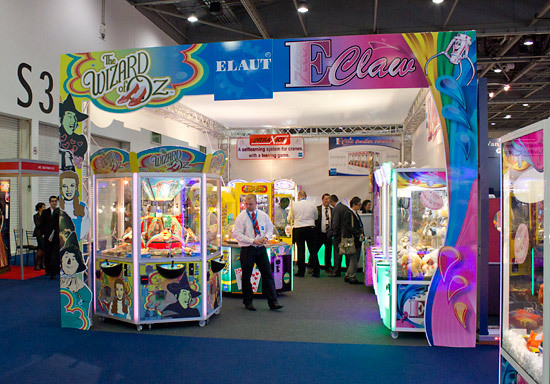 Elaut also had a stand at the show and one of the products they were promoting was their Wizard of Oz coin pusher. The pusher is the first licensed product the company is making using the Wizard of Oz theme. 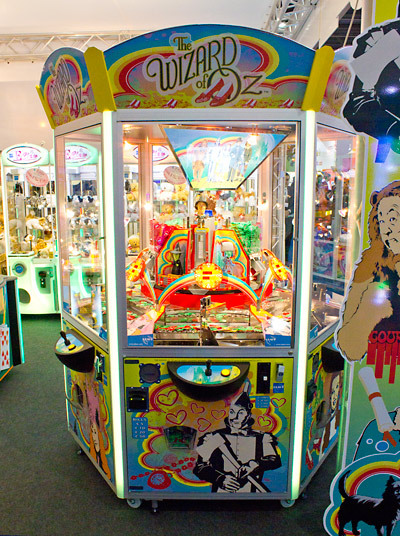 The second is to be the Jersey Jack Wizard of Oz pinball due out at the end of the year. 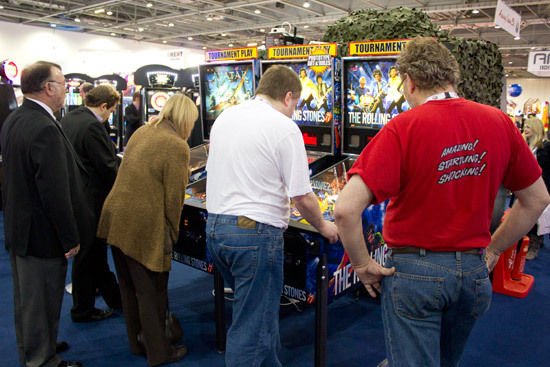 While that concludes our look at EAG-Expo, we aren't quite finished with pinball themes yet because we received a tip-off there was something which might interest us a mere one hour's tube ride away at the ICE show in London's Earl's Court. Earl's Court used to be the home of the ATEI coin-op amusements show, where it co-existed with smaller gaming and betting shows. 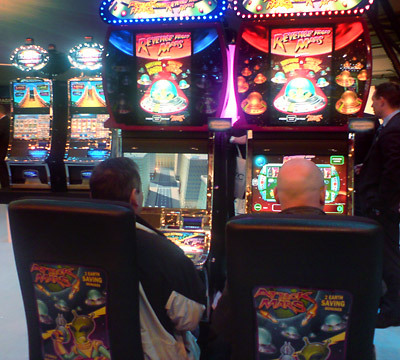 Over the years, the gaming and betting side expanded while the amusements section shrank, until the amusements vendors were squeezed out and set up EAG-Expo last year. 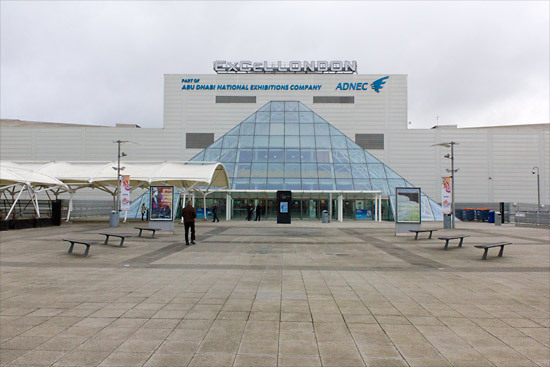 The ICE gaming show is where we find WMS Gaming - the former Williams Electronics. 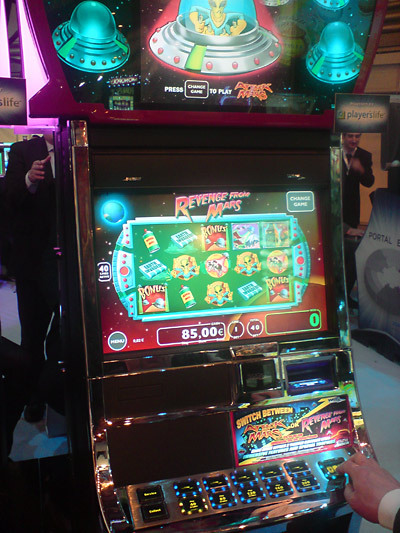 While WMS Gaming have assiduously turned their back on their pinball past, they finally leveraged two of their most popular themes to create a new slot machine - Attack from Mars & Revenge From Mars. Players can choose to play either Attack or Revenge - Attack takes place on Earth while Revenge takes you to outer space - and swap between the two at any time. 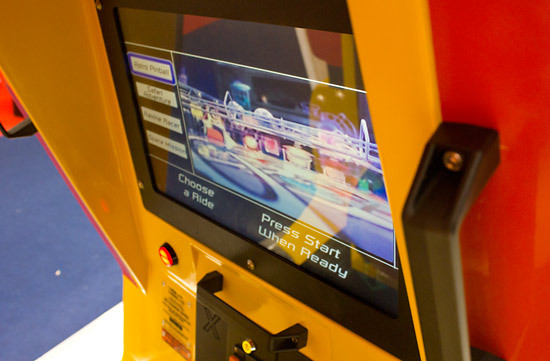 Each has its own set of graphics and sound effects, with immersive sound systems built into the seats, but are essentially video slots with a couple of related bonus features. 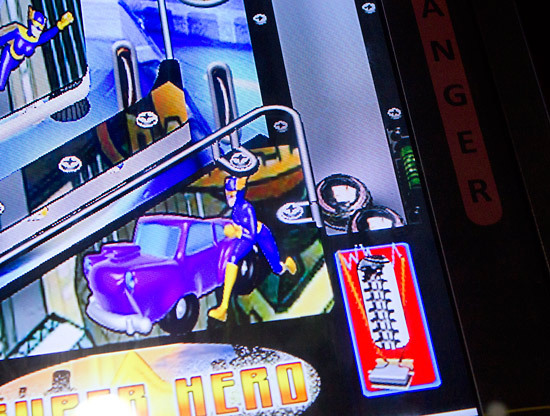 As we wrap up this year's report, we'll leave you to ponder the irony of pinball themes ending up in the very product whose success resulted in the closure of the same company's pinball division.